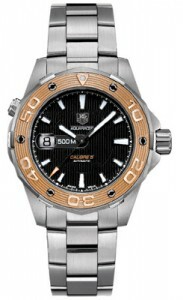 This part of the Aquaracer line begins to incorporate the warmer colors of copper and amber. It makes a nice fit and we hope to see similar experimentation . Tired of luxury watches that are bled dry of color? Do you feel like your wrist should have just as much zing as your tie? Perhaps the new Tag Heuer Aquaracer WAJ2150.BA0870 Cal. 5 Men’s Watch is for you. You’ll look good and if you shop around, your pocketbook will feel good too. Tag Heuer promises a warranty on all of their watches and also offer a lifetime-replacement guarantee for their batteries. These are the promises made by a brand-name that has earned bragging-rights for quality for many years of service. This quality is plain in this new Aquaracer watch. The traditional brushed steel band is accented smartly with a copper frame surrounding the black ceramic clock face. Drawn in subtle engraving are layers of smaller circles within the frame that mimic an almost woody texture and they are offset by the stern vertical lines in the ceramic. Overall, it brings the clack together as a contained, elegant unit. The hands of the WAJ2150.BA0870 are luminescent and easy to see. Also raised upon the timepiece’s frame are easy-to-read numbers for getting the time at a glance. Aside from promises of quality, this new member of the Tag Heuer line is fully adjustable and has a scratch-resistant waterproof covering made of sapphire-crystal. By way of luxury watches, you are lucky to find one that is water resistant up to a thousand feet – the WAJ2150.BA0870 is water resistant up to an astounding 1650 feet. Does that mean you should go scuba diving with your Tag Heuer in tow, probably not. But just in case you ever wanted to, the option is there. If you want to see variations in color, similar models in the Aquaracer line have other tones of metals to choose from. The price of the WAJ2150.BA0870 is not atrocious considering the design advances and the clear quality of its water-resistant casing. At a starting price of $3,850, you could easily feel intimidated by this little number. Try not to fret! Many online stores offer authentic Tag Heuer watches for around $2,695 if you can catch them on sale days. These still come with the coveted warranty and lifetime-replacement perks that buying straight from the manufacturer would. The appeal of this watch perhaps lies in the fact that we can see where the Aquaracer series is heading. If this is any indication, the future will leave a lot to look forward to.